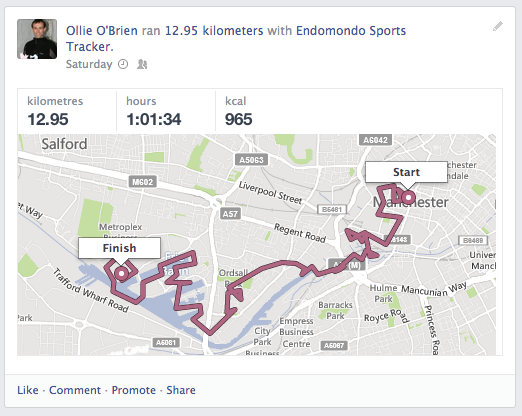 I’ve been looking for a while for an online service that would post my recent race routes to Facebook, for my friends to see when I’ve been running, orienteering or cycling. This proved to be surprisingly difficult to do, but I have finally found a service that meets my specific requirements, Endomondo. * Map to be decent sized, i.e. not tiny unreadable thumbnail. * Post to only my friends on Facebook, not the whole world there. * Use the correct day of the race, in my Facebook timeline. * Accept TCX or GPX files that I have downloaded from my Garmin. …also I had a lot of problems with it saying it had posted to Facebook and then the post didn’t go through. Finally, once it did, it insisted on posting it as world-viewable on Facebook – for brand visibility I suppose, but I only want my friends to see my routes! 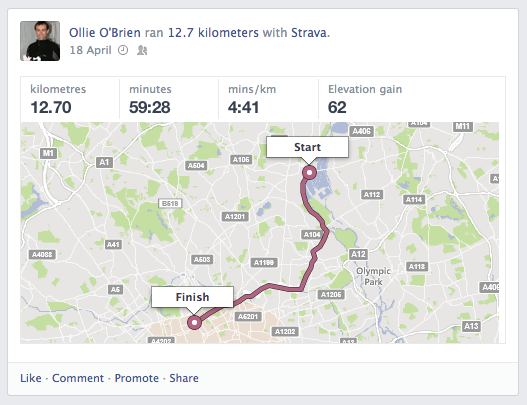 * ViewRanger – like MapMyRun, doesn’t post anything more than a thumbnail on Facebook.